Parking Fees may apply to some events. Buses and oversized vehicles: $15 per event. Overnight parking: $35 per day. Must be self-contained. Overnight parking fee does not cover daily personal vehicle re-entry. A Full Day/Multiple entry parking pass may be purchased at $10 personal vehicles, $19 Buses and Oversized vehicles. Disabled Parking: There are numerous areas of disabled parking around the facility. There are assigned parking areas for those with disabilities in the Red and Green lots on each side of the Arena, as well as the Blue parking lot for Theatre events. 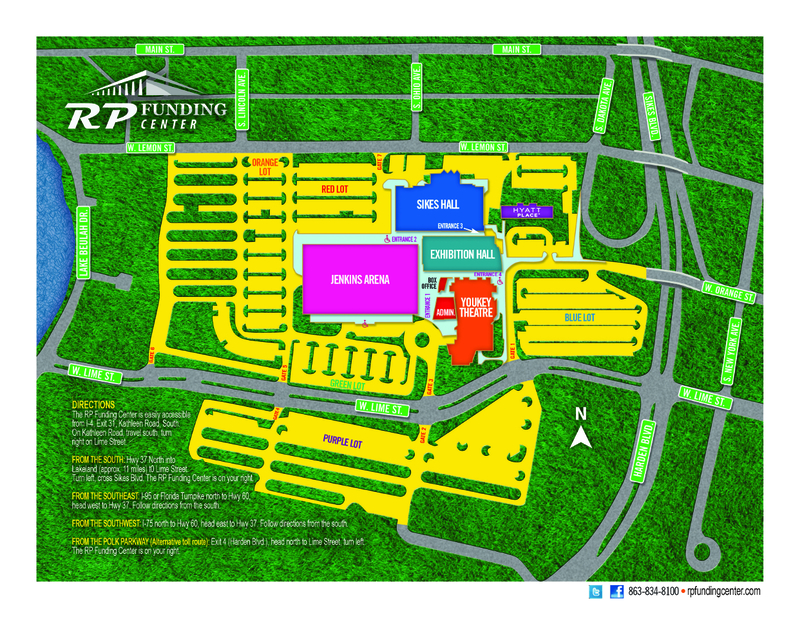 For events in the Arena, Exhibit Hall and Sikes Conference Center, please use the Red parking lot and Entrance 2 into the complex. Entrance 2 is at ground level and provides the easiest access for wheelchairs. Theatre events use the Blue lot and accessible ramp that is available.